…first used in a presentation to the Mackay Local Marine Advisory Committee (LMAC) meeting, Great Barrier Reef Marine Park Authority, September 2014. This entry was posted in Relational Aesthetics, workplace relations on October 22, 2014 by Lucas. 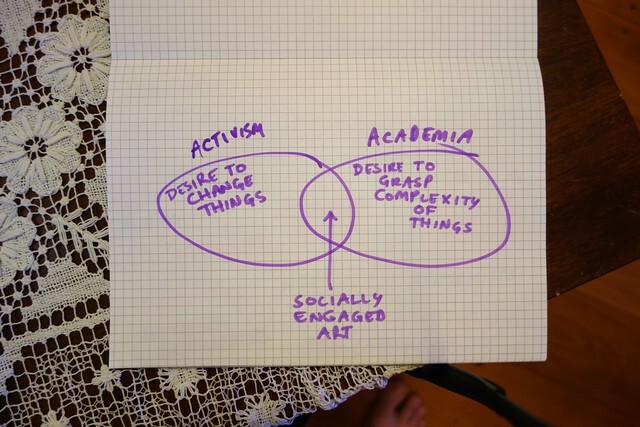 I added the third element – art – because I realised that, with version 1 of the diagram, it could seem that simply bringing together activism and academia might be sufficient for the generation of socially engaged art projects. Not so! 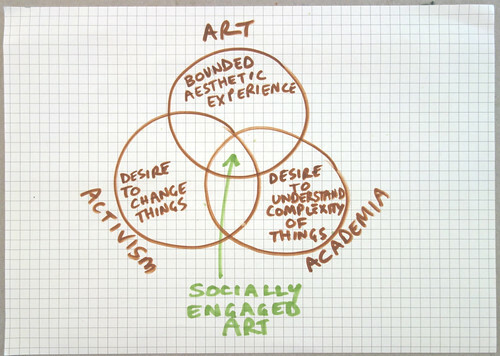 What I’m calling here ‘bounded aesthetic experience” refers to one of the basic conditions of art – the fact that it needs to be framed and separated out from the flow of (eg) everyday life in order to be discernable as such – that is, discernable as art, and not (only) everyday life. 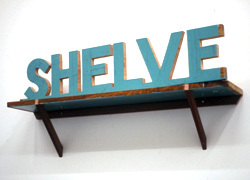 This separative act of framing does not need to be a huge rupture – it can be infrathin. Kaprow, somewhat clumsily, talked about the fact that artists working in the flow of everyday life nevertheless still carry around a “mental rectangle” to drop around whatever they’re doing. 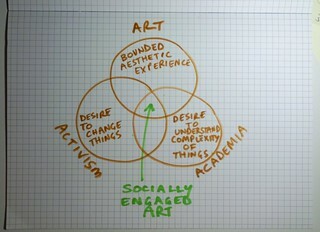 And I think many examples of socially engaged art practice still adhere to this principle, for better or worse. So there you have it – version 2 of the venn diagram – probably even faultier than the first!